Lost lives and lost loves on the rodeo circuit, The Lusty Men is a spirited romantic drama. A love triangle grows steamy and simmers against the unforgiving macho world of riding wild broncos and angry bulls. Jeff McCloud (Robert Mitchum) is an ageing ex-champion on the rodeo circuit. After one spill too many, he walks away from the sport with barely a dollar to his name, having squandered his substantial winnings on gambling, booze and women. McCloud returns to his home town and finds employment as a cowboy, working alongside Wes Merritt (Arthur Kennedy). 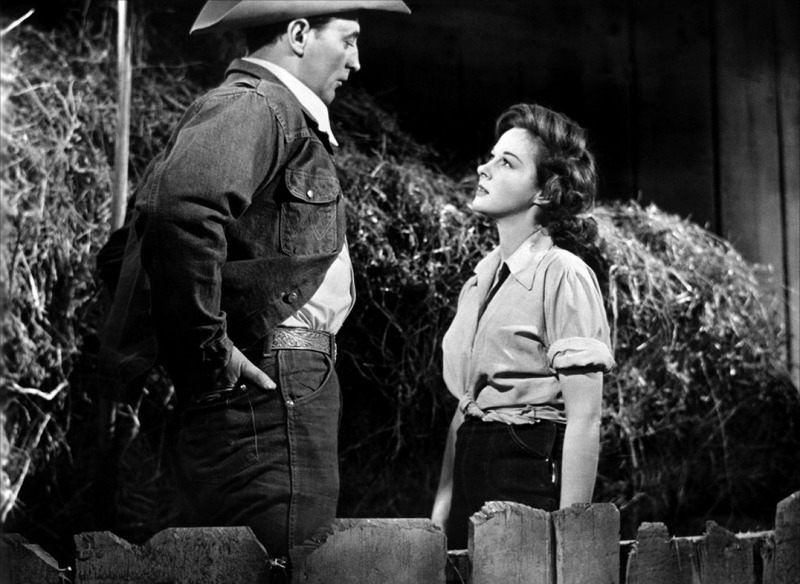 Wes is married to Louise (Susan Hayward), and while she is happy that they are slowly saving to buy a farm of their own, Wes is less patient. He believes that the rodeo presents a short-cut to riches. Wes and Jeff form a partnership: Jeff will teach Wes the tricks needed to succeed on the circuit, and they will split any of Wes' winnings. Louise is displeased but agrees to join them on the rodeo tour. Jeff's real motive in helping Wes is to remain close to Louise and try to win her heart, although she is loyal to her husband. All three discover that Wes has a real talent riding broncos and bulls, and he is an immediate success, raking in the cash. He also falls in love with the hard drinking, hard partying lifestyle, causing stress in his relationship with Louise. And with success and higher stakes, resentment grows between Jeff and Wes. The Lusty Men works both as a romance and an inside look at the life of rodeo cowboys. An army of writers adapted the Claude Stanush novel, and created rich material for director Nicholas Ray to work with. All three points of the love triangle are strong. Wes and Louise are convincing as a married couple, united by a vision but in conflict as to how quickly they need to get there. Jeff is the catalyst for both, inspiring Wes to seek a quicker source of income and, having put his own dangerous riding days behind him, Jeff is also intriguing enough to pique Louise's interest. But The Lusty Men truly shines when it moves to portraying the rodeo circuit. Ray creates a dynamic environment where success and money provide just a thin veneer. The rodeo life is littered with harsh accommodation, broken men, broken dreams, tall stories, gold-diggers, and countless ways to lose money quicker than it is earned. It became clear that Jeff has passed through all the temptations and emerged on other side with nothing except plenty of broken bones. Wes is starting on the same journey, and the speed with which he both finds success to earn big money and seductions to lose it accelerates the pressure on Louise to question her marriage and take a close look at the relative wisdom and stability offered by Jeff. 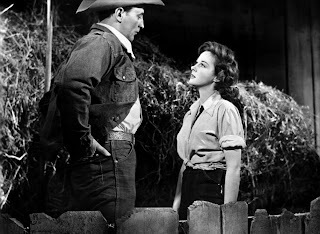 Mitchum and Hayward get the more complete roles, and both are excellent. Mitchum portrays Jeff as a has-been whose heart still beats for one last romantic fling, this time with a lady instead of a floozy, and one last crack at the tour, this time as a coach instead of a rider. Unsure about the success of either initiative, Jeff ironically needs both Wes and Louise to believe in him, likely more than he believes in himself, and Mitchum is perfect in portraying a damaged hero unsure about what comes after the heroics are over. Hayward's Louise is the pivot between two strong men, one her husband with a fire in his belly and the other a friendly intruder into her married life with a growing passion in his heart. Hayward tenderly walks the fragile line of a wife torn between loyalty, frustration and determination as Wes tests her patience and Jeff tests her commitment. 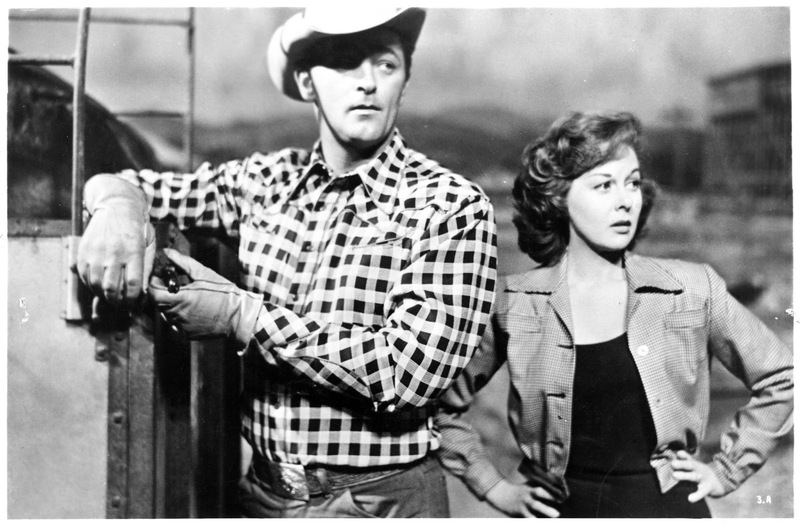 Arthur Kennedy as Wes is fine, if a bit more predictable and vivid in his delivery compared to Mitchum and Hayward. If for no other reason than to display Hayward's flaming red hair, The Lusty Men should have been filmed in colour. More seriously, the movie is full of what should have been colourful settings, from expansive farmlands to the picturesque sequences within the rodeo grounds, and the many thrilling bucking horse and angry bull rides that drive the narrative forward. The black and white photography courtesy of Lee Garmes is good, but colour would have been much better. 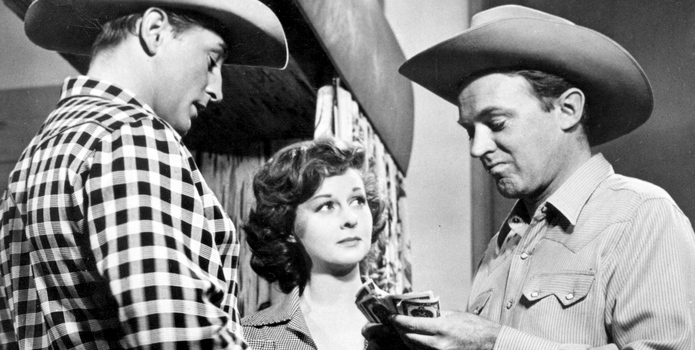 Regardless, The Lusty Men kicks up plenty of dramatic dust and delivers a rollicking ride.